This summer we asked our summer interns to team up and create their very own podcast episodes. Over the course of ten weeks they needed to pitch a concept, draft a script, and record and edit their podcasts. We’ve shared those podcasts here with you on the blog over the course of the last few weeks – here is the final episode from our 2017 Summer Interns! You can see all of their podcasts by clicking on the intern podcast tag. Exhibit interns Jillie, Tirza, and Ryan. Belonging in Judaism is not only an academically complex and fascinating topic, but it is also a very personal one. Every person, regardless of ethnicity, race, and age, experiences the intricacies of the concept of belonging. Work, hobbies, family, friends and other avenues that are defined by people coming together and moving apart are integral to being human. Belonging and in turn not belonging are unavoidable elements to the human experience. 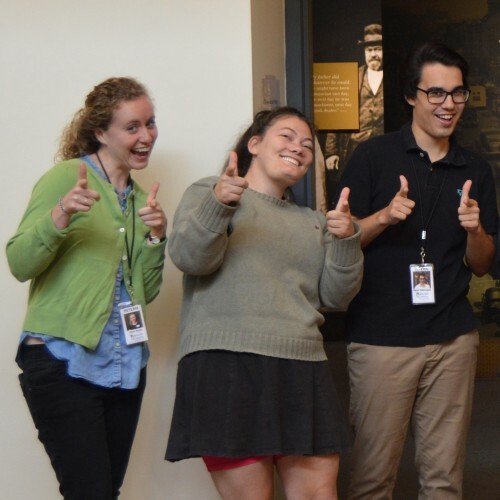 In this podcast episode summer exhibition interns Tirza Ochrach-Konradi, Ryan Mercado, and Jillie Drutz share their personal narratives of Jewish belonging and discuss the involvement of our general millennial age group with Judaism.